The all-new, 2nd generation Suzuki Ertiga is already on sale in Indonesia, an MPV loving nation. The Ertiga MPV will get a sportier variant soon, and will first be officially unveiled at the Indonesia International Motor Show. Here is the first spyshot of an uncamouflaged 2018 Suzuki Ertiga Sport MPV, right from the showfloor. The motor show opens today in the Indonesia for media visitors. 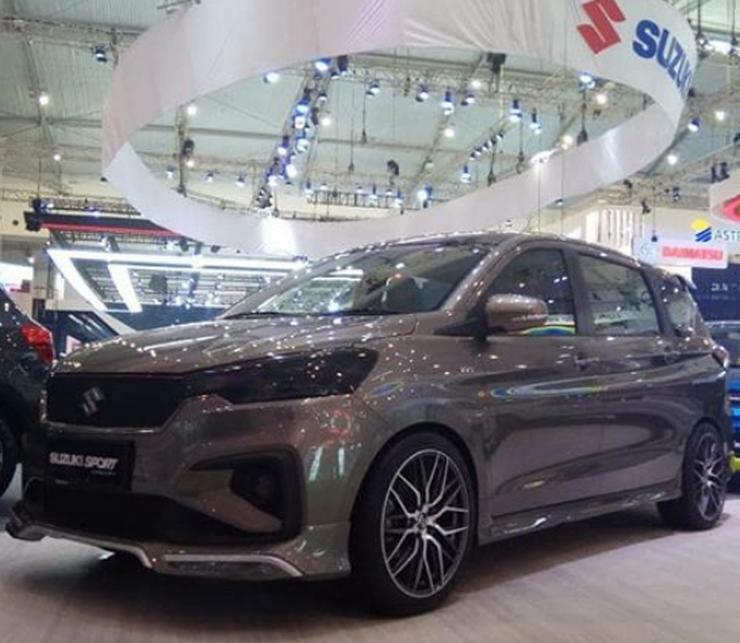 More pictures are likely to be made available later in the day, and for now, information suggests that the Ertiga Sport will be a vehicle with a cosmetic makeover rather than a performance oriented model. From the spyshot, we can make out that the Suzuki Ertiga Sport gets multiple styling changes that include a blacked out front grille, smoked headlamps, new alloy wheel, a body kit and a roof spoiler. The MPV also seems to be running lower profile tyres. Under the hood, the newly introduced 1.5 liter K-Series petrol engine with 106 PS-138 Nm is expected to continue unchanged. Transmission options will include a 5 speed manual gearbox and a 4 speed torque converter automatic gearbox. While many were expecting a 1.4 liter turbocharged petrol engine on the Ertiga Sport, Suzuki seems to be playing safe. The 1.4 liter turbocharged petrol engine is offered on sporty Suzuki cars sold in developed countries. This motor makes 140 Bhp-230 Nm, and is offered on the Suzuki Swift Sport and the Vitara S models. The engine gets 6 speed manual and torque converter automatic gearboxes. Such an option on the Ertiga Sport would have given the MPV some really sporty performance but would have made it quite pricey for most buyers, which is perhaps why Suzuki is sticking to cosmetic enhancements to justify the ‘Sport’ moniker. Meanwhile, the all-new Ertiga will be launched in India later this year.